Mountain Home High School will be offering summer school classes to help students with credit recovery. Fees: $85.00 per course for in-district students who do not meet the “at-risk” criteria. Fees are waived if “at-risk” criteria are met as outlined by the Idaho State Board of Education and are approved by the school counselor and verified by the State Department. Open Registration: Registration can be completed either online or by completing the registration form and is due by 4:00p.m. May 25, 2016. Online registration can be completed at http://tinyurl.com/MHSDSSRegistration. Paper forms can be turned into the MHHS Counseling Office. Student summer school registration will not be processed until payment is received or an at-risk determination has been made. Payment: Payment may be made either in person by check, cash, money order, Visa or Master card, or online at http://tinyurl.com/MHSDSSPayment (Visa, Mastercard only). Please make payable to MHHS. Refunds: Refunds will only be given prior to the first day of class. No refunds will be given after June 1, 2016. Transportation: Students are responsible for transportation arrangements. Lunch: Lunch will not be provided during summer school sessions. Final Exams: The last day of class will be final exam day with no opportunity for make-up finals. Final Exams must be taken at scheduled times. With this in mind, please plan vacations, camps, and other activities after the last day of the session(s). Grades: Grades are available via the Parent / Student Online Portal. 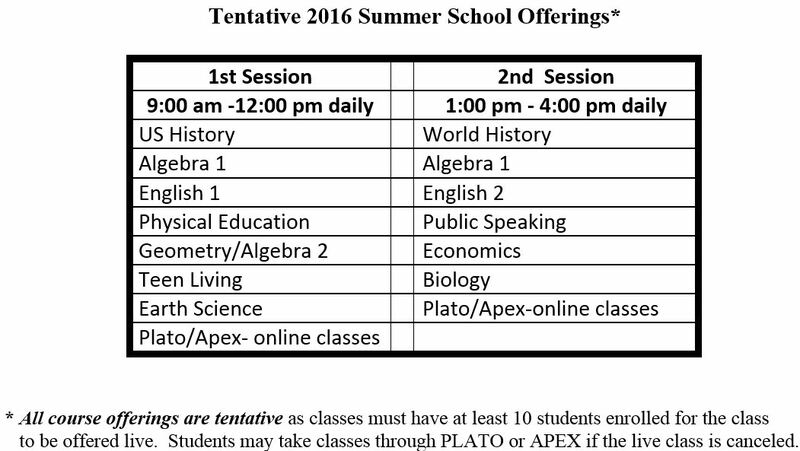 Courses offered live will not be offered through Plato / APEX. Class Rosters: Class rosters will be posted on the front doors of Mountain Home High School Friday, May 30th after 6:00 pm. It is important students consult with their counselor regarding class choices to confirm they fulfill graduation requirements. Please take time to review the information completed on the registration form to ensure accuracy for proper class placement. Attendance Policy: Because of the condensed nature of summer school, a student may not miss more than two (2) periods in any one class for any reason. A student who accrues a third absence in any one class will be dismissed from that class and lose credit. No pre-approved absences will be approved by summer school staff and the summer school attendance policy will be strictly enforced. DO NOT sign up for summer school if you cannot meet the attendance requirement. Tardies: A student will be considered tardy if he/she enters a class up to ten (10) minutes after the late bell rings. Students entering class 11 – 29 minutes after the late bell rings will be given an extreme tardy. Any student who enters the class thirty (30) or more minutes after the late bell will be consideredabsent. A combination of any three (3) tardies or two (2) extreme tardies will be equal to one (1) absence. removal from summer school for violation of the attendance policy. Discipline Policy: As an extension of the regular school year, Mountain Home Summer School will follow the same rules and policies outlined in the Mountain Home High School handbook and Mountain Home School District policy. A student’s prior disciplinary record will be considered if disciplinary action is necessary during summer school. Any rule violation that would result in suspension during regular day school will result in removal from summer school. Disciplinary action taken against a student during summer school may impact a student’s attendance rights the following year in his/her regular school. 1. All students are expected to comply with each teacher’s classroom management plan and follow directions at all times. Two (2) discipline referrals in one class will result in withdrawal from that class. 2. Cell phones are not to be used during class time unless explicitly allowed by the teacher for educational purposes. 3. No food or drink (except water) is permitted in classrooms. 4. Mountain Home School District dress code will be strictly enforced. 5. No profanity or other inappropriate language will be tolerated. 6. Any use/possession of alcohol, tobacco or other drugs will result in immediate removal from summer school and local law enforcement will be notified. 7. Any student involved in a fight or confrontation will be removed or suspended from summer school. 8. Any three (3) discipline referrals during the summer session will result in removal from summer school.